Various Indian governments have been pushing the global credit rating agencies (CRA’s) to reexamine the country’s credit rating given its clean seventy-year credit history and recent economic growth. Last week Moody’s finally relented and raised India’s sovereign credit rating by one notch from Baa3 to Baa2. What does this mean and what is the significance of this “ upgrade”? A credit rating allows investors to assess a borrower’s ability to repay a debt ( and the interest on the debt) based on a combination of factors including past credit history, existing levels of debt, and the capacity to pay back debt. The higher the rating, the safer the borrower and lower the interest rate on their debt. A country like India needs to borrow a lot of money in the international capital markets to meet its development needs. Currently, it spends 18% of its annual budget just to cover interest payments on existing debt–a rather substantial amount that could otherwise be used for development. It is vital, therefore, that India gets as high a rating as possible to minimise this interest expense. While there are over a hundred CRA’s in the world, the global market is dominated by three agencies, Standard and Poor’s (S&P’s), Moody’s, and Fitch who collectively control 95% of the market share. They are all privately owned and charge a substantial fee from the countries (and corporates) whose debt and financial instruments they rate. All three companies are US-based, and it is generally accepted that the government of the home country does influence the rating decisions. Some observers have suggested that India’s improved relations with the US may be partly responsible for the recent upgrade. Others have argued that the threat of setting up a competitive credit rating agency that emerged during the BRICS Summit held in Ufa, Russia in 2015, may have triggered this long overdue upgrade. There is significant lack of transparency in the rating methodologies adopted by these agencies. The rating process starts with the country sharing economic and financial data with the agency after which a team of analysts visits the country to meet with government officials, Reserve Bank representatives and policy experts. The analysts then prepare a report for the rating committee which eventually assigns a rating. There is, therefore, a fair amount of subjectivity in the process. While each CRA has its own rating system, the general convention is to provide ratings on a letter scale, with AAA being the safest credit and C representing the highest risk borrowers. 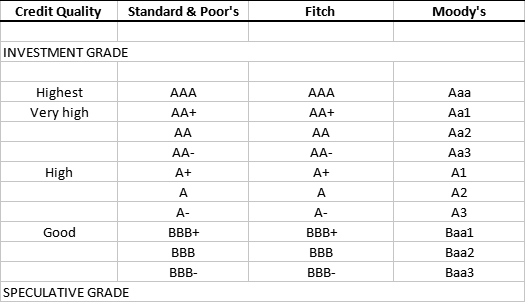 Moody’s Baa rating category –further subdivided ( in descending order) into Baa1,Baa2,Baa3–represent medium-risk bonds, one grade above speculative bonds. Indian sovereign debt falls in this medium-risk category. The global financial crisis of 2008 changed the importance of credit ratings. Investors were badly burnt from erroneous ( and in some cases fraudulent ) ratings given by these CRA’s on assets that were of very poor quality. The vast majority of the mortgage-backed securities that went belly up had the highest AAA ratings. As a result, investors don’t care about ratings as much as they used to and credit ratings — which were once the only thing that mattered to investors — are today just one of the myriad things investors look at. So while it is good that India’s rating has improved, global investors will look for other indicators before deciding on the rates to charge on debt given to India. Aggregate global economic growth has dropped from 4.5% in 1985 to 2.6% in 2016, primarily as a result of governments getting larger worldwide, and a doubling of social welfare spending. Governments now are in greater debt–the global debt to GDP ratio has doubled from 47% in 1985 to 95% in 2016. Also, credit quality has declined precipitously, and the number of issuers in the Baa rating category has increased from 10% of the total in 1985 to 45% in 2016. In other words, one out of every two bond issuers is rated in the Baa rating category. This makes the credit market in this Baa rating group very competitive, and countries like India have to offer higher yields to investors to get credit. The chart below lists the countries with the same rating as India ( Baa2). These are the countries India has to compete against in the global credit markets. India’s current public debt (as a percentage of GDP) is among the highest within the group. Many economists argue that a better measure of indebtedness is debt as a percentage of tax revenue because the government does not have access to all the income produced in the country (GDP) –only the share it collects in taxes. From a credit rating perspective, if a family’s debt exceeds three times its annual earnings it is worrisome. India’s debt is 7 times its annual earnings, and so on this measure, India’s debt looks scary. It is more than double of any other country on this list. Also, interest payments take up a very high percentage of the annual budget–almost 18%–higher than any other country in the group. From a creditor’s standpoint, this is not favourable since both existing debt levels, and interest servicing capacity is unfavourable. India also has the lowest GDP per capita even after adjustment for purchasing power. What India has, however, is the potential for growth. Its 2016 GDP growth rate was the highest, and it is imperative that India continue to liberalise and free the economy to keep growth rates high. India’s upgraded credit rating comes at an important time ( politically) for the Modi government. While its real impact on the country’s overall indebtedness and interest obligations will be minimal, the upgrade has symbolic value and could result in increased FDI flows. For India to realize the full benefit of this upgrade the government must increase the pace of policy liberalization, including a smaller government and greater economic freedom. wonderful informative article! Wonderful website! Found on DNA. That’s the bell of liberty. It stands for political and economic liberty, free markets, and minimal state intervention in people’s lives.